Hello, did you turn on the Advanced workspace? Advanced workspace is on. Edit Articulation Properties shows Up Down Auto, but there is no change between Up and Down. Above Staff and Below Staff work fine. Is there another fix? Or is there a way to paste a Down Bow into the Articulations palette? The one on the left is a down bow. Aha! Yes. I have both of those. I was looking for a reversed up bow to match the printed music. I'll leave a transcriber's note that the old format is not available in current technology. And I keep saying things backwards. The one on the right is the down bow. The music is not string music. Looks more like piano music. Those can't be bowing directives. FWIW, the bowing symbols V, and the other symbol that looks like an upper-case Greek Pi are, I believe, old symbols that derive from letters. Never seen the inverted V, or a bowing symbol below placed beneath a note. As for what those symbols mean, I dunno. If I had to guess, I'd say accents, but not standard. I've never seen the marcato below the note. Organ toe directives?... Nah. I give up. Indeed, those aren't bow markings but quirky-looking marcato accents. 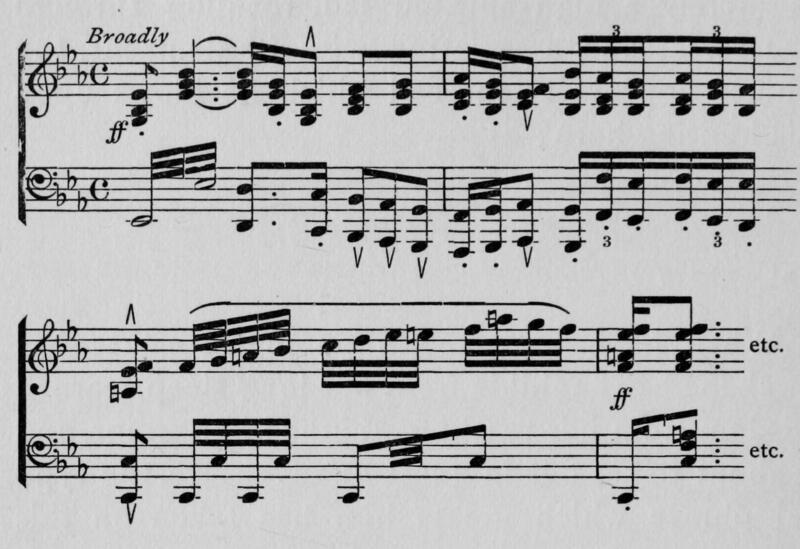 MuseScore has them but in a more standard appearance, and flipping them with "x" does what you would want.